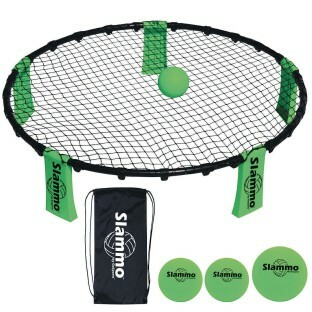 This action packed 2-on-2 game is similar to volleyball, but with a smaller ball and a circular net. The rules are similar to volleyball where each team has 3 hits to spike the ball into the ankle high circular net. Teams volley back and forth until a team is unable to return the ball to the net. The first team to 21 points wins. Engineered with an improved design over the competition that provides 100% net coverage and eliminates the hated 'pocket shot'. The Slammo Set includes two competition size 9cm balls and also one 12cm training ball for beginners or younger players. The game can be quickly assembled and it fits neatly into the included backpack style carrying case. The game is a great workout and much easier to setup than full size volleyball. Recommended for ages 12+.